As part of my love for pumpkin flavoured everything (except for pumpkin lattes...those don't actually have pumpkin in them), I get excited for pumpkin ale to make its seasonal appearance! A few weeks ago, I bought three bottles of Pumking, which is my favourite of the pumpkin ales I've tried. It has been a busy month, and I still have those three bottles in my fridge, so I thought I would cook with one (and drink the rest of the bottle once it was open, of course!). I found this recipe, which I had planned to make, but later came across a totally unrelated recipe that had me asking the question, "how is this cooked in a slow cooker with no added liquid?" Then the solution came to me: Use pumpkin ale for the liquid! I veered off from my original plan, but this recipe was worth it. Also, I was pleasantly surprised at the nutritional tally for this one...I don't tend to think pouring beer over fatty cuts of meat is healthy (it sounds delicious though! ), but this was surprisingly low in calories, and high in protein and fibre. For the sake of laziness, I bought cubed butternut squash in 400g packages. Spray Canola inside slow cooker pot to grease. Place butternut squash cubes evenly in bottom of pot. Place six pieces of prosciutto on a cutting board. 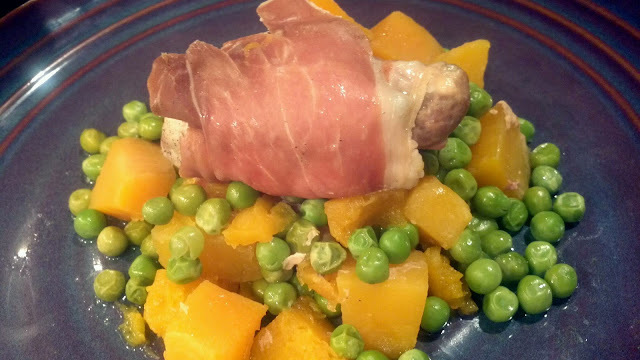 Take each chicken thighs and unravel it so it is flat on top of a prosciutto. Roll them up tightly and place them on top of the squash in the pot. When all six chicken rolls are complete, season with black pepper. Pour pumpkin ale over top of chicken rolls. Place the lid on the slow cooker and set to high heat for 4 hours. When there is 1h30 remaining on the cooking time, remove the lid and quickly add frozen peas. Replace lid and finish cooking.